It's worth remembering though that using a CGM can be information overload and lead to more anxiety around managing your diabetes that before. Always remember that everybody's diabetes is different and what works for you may not work for someone else! This post is divided into three sections: What is a CGM, Which ones are available in Ireland at the moment and the piece you are probably most interested in, What are my Funding Options if I want one? Firstly, What does it do? A continuous glucose monitoring system monitors glucose levels 24 hours per day. It takes a glucose value every 5 minutes and gives the wearer an average blood glucose level and where it’s heading (trend arrow) for that hour. One very important element of a cgm is to always remember that the glucose measurement is taken from the fluid between skin cells (interstitial) and not from capillary bloods in your fingertips like a traditional glucose meter. The reading from a cgm is approximately 10 minutes behind the reading from a glucose meter. (If you know this bit already, skip ahead to the How do I get one section). Sensor: This is the part that goes under the skin. It’s also the part that costs the most because the sensors have to be replaced between 7 to 14 days. A flexible wire is inserted under your skin, held in place with an adhesive patch and has a plastic cradle on top of the skin that the transmitter clips into. Transmitter: The transmitter sits on top of the skin, collects the glucose information from the sensor and transmits them to a receiver. Receiver: The receiver receives the information and displays it on a screen along with a trend arrow and often a graph of up to the previous 24 hours. (The Libre displays more than that). Sometimes the receiver is built into an insulin pump like with the Medtronic Veo & 640G series or the Animas Vibe. And sometimes the information can be sent wirelessly to a compatible smart device. There are four CGM devices available at the moment. Available through the HSE if you meet qualifying criteria. See more below. The Dexcom G5 Mobile CGM System has been around for a number of years, This system does away with the need to have a receiver device because the transmitter sends data wirelessly to your compatible smart device. The G5 requires calibration from a finger stick check twice per day and the sensor lasts 7 days. More information here. The big difference between the G5 and the G6 is that the G6 does not require fingersticks to calibrate and it’s smaller with a 10 day sensor life. Available through the HSE to people with diabetes aged between 4 and 21 years if you meet qualifying criteria, and exceptional circumstances. See more below. The Freestyle Libre is, technically, not a cgm but a flashGM. The difference being that the wearer has to scan the sensor to get the glucose value and trend information. If you don’t scan every 8 hours the data is lost. Since 2018, the Libre Link app has been available in Ireland and so the reader device is not essential as your smartphone becomes the reader. The Libre does not have the ability to alarm when glucose levels are low or high, however, the Freestyle Libre version 2 due in 2019 will have this option. More information here. Here is a review that co-founder, Rebecca Flanagan wrote on behalf of her daughter who continues to use it. 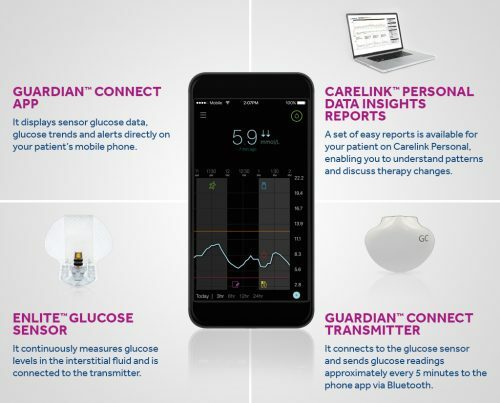 Medtronic also manufacture insulin pumps but they do have a stand alone continuous glucose monitor called the Guardian Connect, which was launched in Ireland April 2017. This CGM also transmits information wirelessly to the Guardian Connect app on a compatible smart device. Find out more here. The eligibility criteria for reimbursement of the Freestyle Libre for children with type 1 diabetes is available here. There is no set qualifying criteria for CGM’s for children with type 1 diabetes but most consultants look to the UK”s NICE Guidelines. ** However, even if you meet the clinical need for HSE funding of a cgm some areas still do not fund them. If you are interested in getting a cgm and don’t meet the qualifying criteria you do have a couple of options to ease the cost. See more information here.